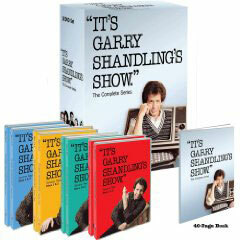 Learning of the October 20 release of the DVD set of the complete series of “Its Garry Shandling’s Show” was a highlight of my summer and caused the catchy “This is Theme to Garry’s Show” to lodge in my brain. This 1986-1990 clever and witty Showtime sitcom was a premium channel hit roughly a decade before HBO series took off. Watching some of the 72 episodes in the set reminded me of the great similarities between this show and “Seinfeld,” which did not air until years later. “Shandling” depicts the daily life 30-something tall, thin, single, neurotic stand-up comedian Garry Shandling. Shandling also went one step further than Seinfeld by directly making fun of his hang-ups that included his obsessions with his hair and his large lips. Like “Seinfeld,” much of the humor of Shandling revolved around his many unsuccessful relationships. One of the best ones was a spot-on parody of the film “The Graduate,” in which a friend of Shandling’s mother seduces him. An appearance by an actor who appeared in the film was a nice treat. Shandling even had a platonic gal pal, a nerdy heavy-set long-term friend who wore glasses, and another goofy spaced-out friend who was very lanky and apparently did not have a job. Additionally, Shandling says in an entertaining interview that the DVD set includes that he discussed making a sitcom with NBC before making the deal with Showtime. Shandling makes a joke about NBC telling him that they did not want to make a show about a comedian. Shandling did not share whether he ruined, and eventually ended, the life of an NBC executive. Shandling went one step further than Seinfeld by removing the fourth wall that exists between performers and their audiences; Shandling regularly addressed and interacted with the studio audience and also addressed viewers. This went to the extent of having the camera follow him as he walked between the sets on the show. Shandling additionally made good-hearted fun of his using clichéd sitcom plots that included marrying a cleaning person so that she would not be deported and having a baby born on the show. Shandling further used hilarious techniques to depict the passage of long periods of time in stories that lasted roughly 30 minutes. We learned after several newspapers were thrown at Shandling that two weeks had passed and a growing mound of laundry in his living room represented one month. Shandling also stepped inside his flashback booth when he wanted to relive a prior experience. The outtakes that the DVD set included showed as well that Shandling really fed on having a live audience and from involving them in the production to an even greater degree than the episodes depicted. I would have loved to have seen Shandling respond to an audience member texting or his or her cell phone ringing during a show. Shandling also drew on his experience as the guest host of “The Tonight Show” during the Johnny Carson era by having stars appear as themselves regularly on his show and become involved in the stories. The following are a few of the many examples of this. Shandling put Rob Reiner to work cleaning when he dropped by, got advice from Reiner’s father Carl when an audience member died during a taping; June Lockhart came by to get “Laffie” after she escaped through the 52 year-old Timmy’s bedroom window, and Tom Petty stopped by regularly to say hello and sing a song or two. This release is appreciated particularly too because the studios seem to have cut back on the number of complete series DVD sets that they are releasing for the upcoming holiday season. The packaging of “Shandling” is nothing special, but the episodes, the special features, and the companion guide that includes thoughts by veteran comedy writer and producer Larry Gelbart and rising “player” Judd Apatow make this set special. I am sorry that I could not offer a catchy theme song like Shandling's, did not make any jokes about my tuxedo cats, or have any celebrities drop by while I wrote this review. I do invite you to e-mail me at tvdvdguy@gmail.com as my imaginary closing credits roll. Before the Internet, before reality TV, no one saw what television could be more humorously and with more vision than Garry Shandling. In 1986 Garry Shandling was poised to become a permanent guest host on Johnny Carsons The Tonight Show. Instead, he took a chance on an offer from fledgling cable network Showtime to create his own television series. No questions asked. A surreal look at the daily life of a young single man who is a comedian, Its Garry Shandlings Show was not a typical sitcom: Shandling would break the fourth wall to include the studio audience and the viewers at home in on the actual making of the show. Experimenting with the sitcom form meant inviting the audience onto the set, playing with the passage of time and generally exploding the genre and making art of the debris. Teaming up with Saturday Night Live writer Alan Zweibel, the two men put on a fourth-grade play every week for four seasons. With a crew of talented young writers (including Tom Gammill, Max Pross, Al Jean, Michael Reiss, David Mirkin, who would go on to write Seinfeld and The Simpsons, and Ed Solomon, who wrote Men In Black), television history was made. Over the years, guest stars (playing themselves) included Tom Petty, Rob Reiner, Vanna White, Red Buttons, Dan Aykroyd, Martin Mull, Gilda Radner (in her last TV performance), Carl Reiner, Chevy Chase, Red Buttons, Jeff Goldblum, Don Cornelius, The Turtles, Los Angeles Mayor Tom Bradley and more. From its unforgettable theme song to its closing credits, Its Garry Shandlings Show was award-winning, mind-bending television for four seasons, and its influence is clearly seen in the best TV comedies through the decades to follow.